Spring has arrived! I have been loving the sunshine and flowers these past few weeks (achoo!!). My Little guy has been waking up and running with his shoes in hand to the door and signing “outside”, and saying “owww,owww”. He is obsessed with outside right now. As a result of his obsession I’ve been spending a lot of time outside and a lot less time inside, thus, my house and blog have suffered. That’s what spring is for, right? Some positive results have come from this. I’ve started my garden! No, this is not a picture of my garden, unfortunately. I hope to write and post pictures on that soon. 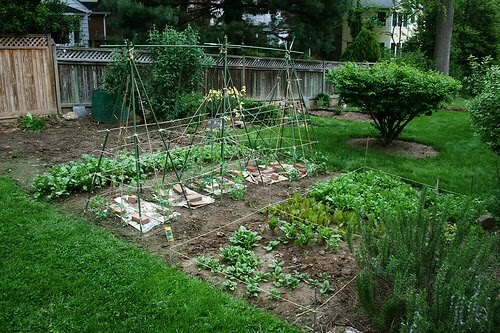 I’m so excited about it this year, I am doing a square foot garden in my front yard. I have had zero success in my past ventures in my shaded back yard, so I moved it to the front and I am feeling hopeful. I was very inspired by the Dervaes family. If they can do all of that, surely I can do a small garden and keep it going this year. It’s also working as a great homeschooling project. Big Sister has really been enjoying the planting and watering. I hope she continues to feel motivated, ( and me too!). So I have a lot of odds and ends to share with you. If you haven’t already heard via Facebook, please check out our most recent Soapnuts giveaway through http://www.baby2green.blogspot.com/ Your chance are looking pretty good at winning! It’s World Homeopathy Awareness week ( April 10-16th). I’ve written recently about homeopathy and some basics about getting started with your family. If you are looking to research in further this may be a good place to start. Several different states are having events, unfortunately, there is nothing in TN, but there is in GA! I wanted to mention the Food Revolution with Jamie Oliver. Have you seen his new show? I’m in love with it. I love his passion for whole, healthy foods for children and families. I was shocked at what the children were eating in the elementary schools, and even more shocked that the 7-year-olds weren’t able to identify a tomato or a pea!! If you haven’t had a chance to see it yet, check it out on Friday nights. It looks like you can watch past episodes online. On a final note, ChildOrganics was chosen by Melodie at Breastfeeding Moms Unite to be a sponsor of her site for the month of April. She was searching for breastfeeding supportive businesses, and we were one of the businesses chosen to be featured. She is hosting a Body Image Carnival this week, so there are some great articles to be read on her site. So go on over and check her out! I hope you are having a fantastic week enjoying the sunshine and your families!